Osteoarthritis is a diagnosis that is often described as “wear and tear” of your joints. Osteoarthritis is a common, age related joint condition. Read on for our top three ways to prevent osteoarthritis. Our bodies are able to move because of joints between our bones. Joints are responsible for our standing, sitting, lifting and moving. Osteoarthritis occurs when the protective cartilage layer at the end of the bone wears down. This happens as we age, but can be speeded up as a result of our genetic make-up or from previous joint injury. X-rays take excellent pictures of joints. They are often used to diagnose arthritic joint conditions like osteoarthritis. 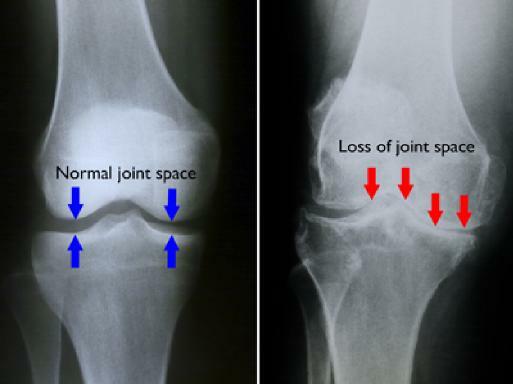 Knees and hips typically take a lot of knocks over the years and are common joints affected by osteoarthritis. Symptoms include stiffness, pain on walking, swelling and difficulty with climbing up and down stairs. Having a joint replacement is an option, but not the first way to treat osteoarthritis. You don’t need to suffer the pain, as a physiotherapist can help to reduce the discomfort. 1) Keep moving. Your joints will get stiffer by not moving and so more painful. Try gentle exercises to increase the flexibility and don’t sit for too long. 2) Keep your muscles strong. The muscles around your hip and knee will protect the joints if they are strong and responsive. Simple squatting exercises, undertaken on a daily basis, can help to maintain your strength. 3) Keep exercising. You may find that you cannot exercise in the same way as you used to due to the joint pain. Don’t stop otherwise your pain will get worse and you will become less fit. Try changing your exercise for something less aggressive to the joints. No matter how bad your osteoarthritis is or if you feel that you are gradually getting worse, we can help to reduce your pain and get you moving again.